In the second in the Puppies Online series Einstein, Bounce and Puzzle are thrilled to be back at Sandcliff Lighthouse for another holiday. There are lots of other pups staying there this time which means fun for everyone! But when the local beach is covered in dog poo, the pals find themselves in a sticky situation. It gets so bad that even the puffins – who visit every year – are staying away! And then the local people start to blame the kennels, even though the pups know that Jackie and Trevor always clean up after them. Who is behind the smelly secret of Sandcliff Beach? 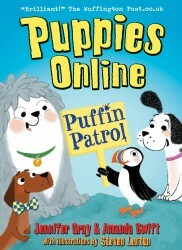 Can the pups uncover the stinking truth in time to save Trevor’s kennels and persuade the puffins to come back?